A Pocket Folder is a sturdy folder used to store and organize documents such as those distributed during a sales meeting or other presentation. 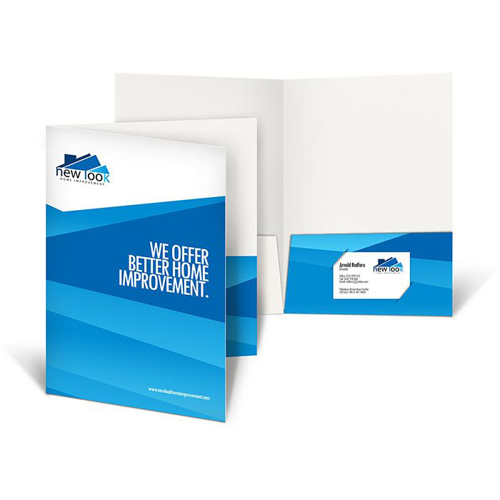 When printed creatively, a presentation folder serves as a means to introduce and promote your organization to new clients as well as enhance your image with existing clients. Your pocket folder can be printed on both the front and back cover. Printing on the face of the interior pocket flaps is also popular, at no additional cost. Please reach out to us if you have a specific folder requirement that you do not see as an option on this page. Please allow 7 - 10 business days for completion.